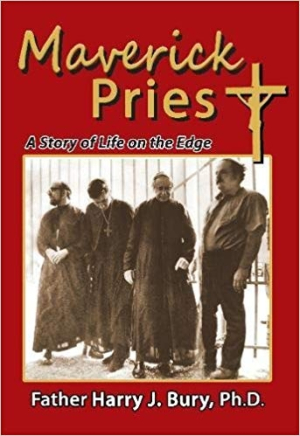 Maverick Priest is a soul-searching memoir that looks back on turbulent recent history through the lens of clerical work. Harry J. Bury’s memoir Maverick Priest explores the challenges of a clerical calling at the end of the tumultuous, political, and violent twentieth century. Bury’s story moves chronologically: growing up in Minnesota, training as a young Catholic priest, protesting Vietnam, obtaining a PhD in psychology, and retiring to work in nonviolence efforts. Because of his objection to the Vietnam War, he was arrested both inside and outside of the country, and his provocative positions often found him at odds with the Church hierarchy. Bury also traveled during his working years, visiting many dangerous places, and his memoir includes a tale of being abducted in Gaza. Bury seeks to understand these events, working toward specific lessons regarding his body, his intellectual development, and his spirituality. The book is also organized thematically, with different elements of the priesthood and the clerical calling explored across chapters. The book’s opening chapters consider what it means to be a “good” priest, something Bury finds it hard to do as his conscience bucks against the establishment and the status quo. He concludes that a good priest should be both “authentic” and a “man of conscience.” Bury’s training and challenges inside and outside of academia paint a picture of an intelligent, driven priest whose idealism sometimes doesn’t fit the expected mold. The book’s structure allows for enough latitude for Bury to expand his consideration beyond his own recollections and make interesting comments on the broader Church. The writing is clear and thoughtful. Bury does not position himself as a star in any of the events he witnessed or participated in, from the the antiwar and civil rights movements to the work of Mother Teresa, but he shows himself to have been aware enough, and involved enough, to make his life interesting. The best material in the work connects Bury’s experiences to his spiritual life. For example, on leaving graduate school, Bury remarks that, in his mind he’d “failed” to be the priest he intended to be, never considering that God may have had different plans for him. Such willingness to be humble in considering the past and to face occasional regrets and missteps makes the book genuine, interesting, and useful. The book has a spoken-word quality about it, pausing here and there to explore and explain its historical elements. Biblical allusions and references also arise, as when Bury speaks about gathering people from the “highways and byways,” a hint at the parables of Jesus. This style is approachable. A comprehensive table of contents, an index of key ideas and people, and pull quotes add further polish.